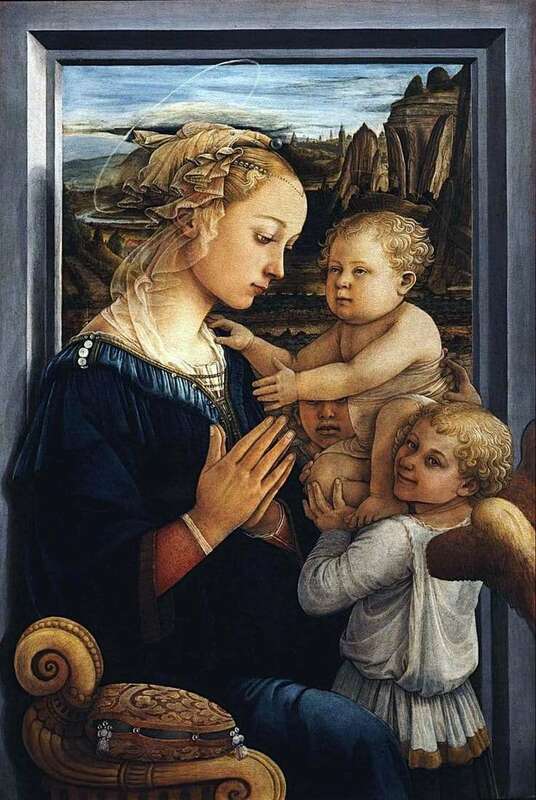 “Madonna with a baby and two angels” – the famous painting by Filippo Lippi. The artist, being a novice, was kindled by a passion for the nun Lucrezia Butti. The girl accepted his courtship, and, refusing to serve God, the couple entered into marriage. Subsequently, they had a son Filippino, he also became a famous artist. This picture just depicts the beloved of the artist Lucretius – apparently, with the artist’s breast son. A beautiful young woman folded her hands in prayer. Pearls are woven into the hair of Madonna, a transparent veil falls over her shoulders. A dark blue dress is also embellished with pearl threads. The baby Jesus at the Madonna in her arms is supported by two curly angels. The gaze of the nearest of them, crafty and gentle, is turned to the viewer. Rather, he looks like a playful boy than a biblical character. In the background is a perfectly traced landscape, the model for which was Flemish painting. The pale sky covered with clouds, the harsh bare rocks and the calm blue smooth surface of the sea reinforce the impression of grandeur and peace emanating from the picture. Partly, the detachment of the landscape emphasizes the warmth of the human faces depicted in the foreground. The image of the Madonna, touching, sublime, but at the same time incredibly earthly, later became an example of imitation for followers. In particular, he was inspired by Sandro Botticelli, a student of Lippi. He was a friend of the artist’s son – Filippino. Since this time, it has become fashionable to depict the Madonnas and heroines of myths as ordinary earthly women – which, no doubt, always brings the viewer closer to the images depicted in the paintings. “Madonna with a baby and two angels” is stored in the Uffizi Gallery in Florence, in hall number 8, dedicated to the work of Lippi.